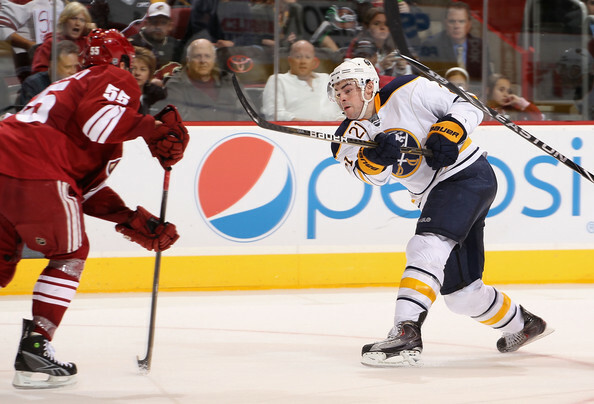 Paul Bissonnette’s mother will get to see him play in an NHL game for the first time. This is a great moment for the Welland native who is often in and out of the lineup due to his role as an enforcer. BizNasty will be in the lineup for Phoenix tonight, how much ice time he gets is anybody’s guess, but I wouldn’t be surprised to see his line rolled out first as a treat to the pugilist and his family. In other news, former Sabre Taylor Pyatt will play his 700th NHL game this evening. Girls seem to think he is dreamy, I always thought he played soft for a guy his size. Buffalo is playing the second half of their sixth set of back-to-back games this evening. According to that same TBN report, the Sabres have taken a few precautions to make sure they have plenty of energy heading into this evening’s contest. Lindy Ruff will certainly go right back with Jhonas Enroth this evening as the rookie pitched a 34-save shutout last night and looked strong in doing so. The Sabres did a great job protecting the house last night and make Enroth’s work pretty easy. Still, the youngster made some huge saves and deserves to be ridden til he bucks this team. 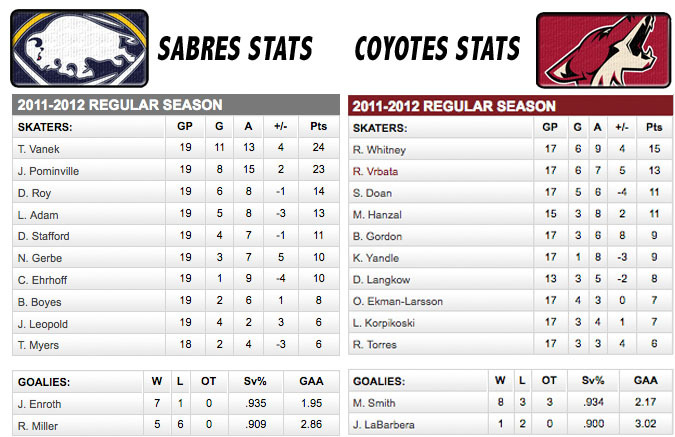 The Sabres will likely ice the same line up as last night, why change the winning combination? Most reports have Jochen Hecht close to a return along with Tyler Ennis. It will be interesting to see who Hecht replaces (guessing Matt Ellis) once he comes back full time. While Hecht is pretty much the NHL leader in bad angle shots, he will offer a stable force for the Sabres in the defensive zone. The last thing I want to see if Luke Adam sent to Rochester in order to make room for Hecht. The Sabres at home. Yep, the whole team is under the spotlight tonight. The Sabres are beasts on the road but are just .500 at home this season. Both Enroth and Ryan Miller have been victimized by lazy play in front of them on the First Niagara Center ice and it is high time the Sabres find a way to put out a solid home effort. Even some of their home victories (Winnipeg) came despite a brutal team effort. This issue needs to be solved now so it doesn’t crop up in the spring.